Any social media platform should revolve around two-way communication. The whole purpose of Twitter was to create better methods for engagement with one another. However, businesses have now seen the benefits of using social networks for real conversations. As these conversations build with your customers, you need a way to pillage through each message to stay in contact, check up on orders or to answer any lingering questions a customer might have. This leaves a lot of businesses wondering what is the best way to search their Twitter history to keep up with the discussion. Whether it’s a Direct Message or direct mention, Twitter is a platform designed for real-time and rapid-fire conversations. Even though the importance of interactions is critical for businesses, Twitter doesn’t have the most optimal features for searching through past discussions. Luckily, tools like Sprout make it easier. In the fall of 2014, Twitter enabled users to search every Tweet sent in the social network’s archive. In the early days, Twitter’s main goal was to provide a search engine feature that could get users immediately connected to the conversations people were looking for. While it took a few years to make this come true, Twitter gives you access to a plethora of conversations that all revolve around your searches. If you’re a business, you might be thinking that’s fine and dandy but there are thousands of Tweets to go through that may or may not have any relevance to your brand. At Sprout Social, we completely understand this problem. On one end, there’s simply too much to search for and dissect. And on another level, Twitter’s search history does not always paint the clearest picture for businesses using the social network to further engage users. For marketers looking to go the extra mile, Twitter also provides an advanced search option to specialize the content you’re looking for on the network. Once you’ve found your keyword, account name or hashtag, you can then click “More Options” near the top of the page. When you choose “Advanced Search” you’ll receive multiple options to help refine or specialize your results. For businesses, this is extremely helpful to find any Tweets from a range of dates in case a customer said he or she left a previous comment. Simply select your dates and any attributing factors (positive or negative) that might be involved with your advanced search. Another positive about Twitter’s search engine is that it can provide businesses with a way to discover specialized brand keywords. Companies using social media should be abreast of their @mentions, Retweets and other tags that could be a customer service issue or a potential lead. Brand keywords are essential to gaining a pulse on who’s saying what about your company. The problem with this basic Twitter search is that it will bring a ton of results and you’ll have to sift through and research everything each time you want this information. This causes a lot of back and forth between your social media strategy and your brand keyword results. That’s why we here at Sprout Social allow businesses to search for Brand Keywords in the platform so your company doesn’t miss any important messages. Additionally, this helps you capture relevant content that’s worth engaging all through a single-stream Smart Inbox. Using Sprout Social to search for brand keywords will prevent you from continuously using advanced search options on Twitter to get this information. Instead, we will relay all related information from these brand keywords into your inbox along with other messages, Direct Messages, new followers and @mentions. 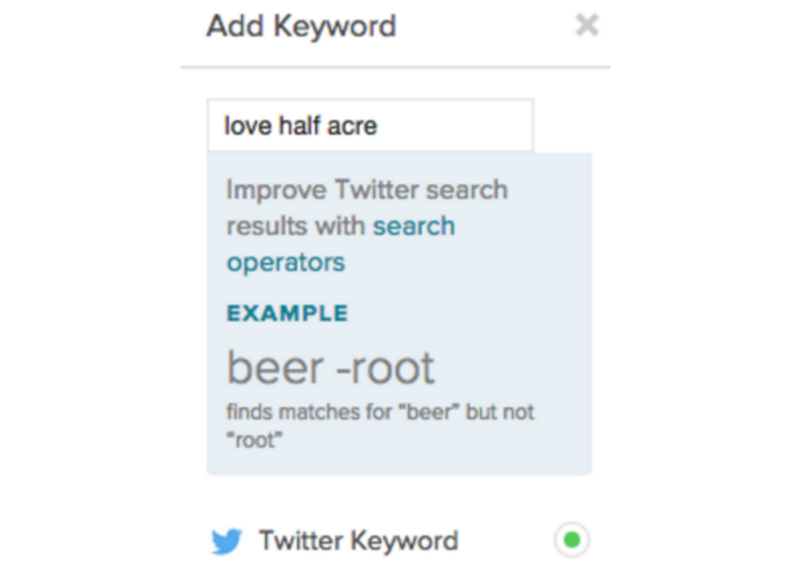 In this example, we see instances of the words “love” and “Half Acre” used in the same Tweet. A basic Twitter search would have made it extremely difficult to find the first comment especially since there are no hashtags used. With our single-stream platform, businesses can use Sprout to increase engagement through drafting and scheduling Tweets, responding to customers and by reviewing your conversation history all within the app. Twitter history might seem like an unimportant feature, but having a archived collection of messages between users will make any social media marketer’s life easier. In fact, your Twitter history can help you with your customer service department as you begin to take on more social media message responses. More than half of consumers expect brands to respond to a Tweet within an hour. And if the Tweet is a complaint, 72% consumers expect an answer within 60 minutes. But the problem is 7 in 8 messages to brands go unanswered within 72 hours. This essentially kills your customer engagement through networks like Twitter. By now, every business should know the benefits of using Twitter. But what’s scarier is the companies that sign up and don’t effectively use the social network and end up hurting their brand more than if they didn’t sign up in the first place. Your chats with customers on Twitter should be like any other conversation you have: fluid, responsive and engaging. 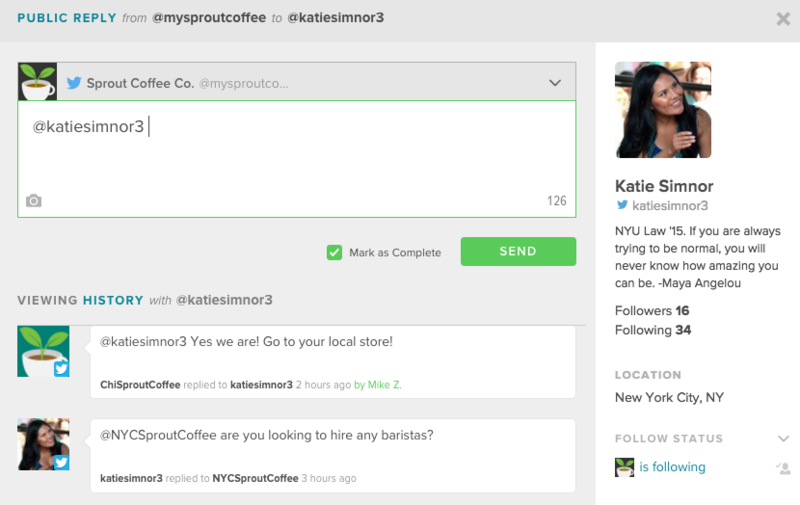 Through Sprout Social’s Twitter history feature, you can review the things you’ve already talked about. For example, if a customer service question arises, you obviously want to have an answer. But what happens when there are multiple people working on the company’s Twitter account who are all trying to answer the incoming question at the same time? Suddenly your staff members are wasting time figuring out the answer and responding while someone else is already on it. This gets even more complicated when businesses have to manage multiple social media accounts. Instead, Sprout’s Smart Inbox uses Collision Detection notifications to let you know someone else is already resolving the ticket. This takes out the pain of digging through Twitter’s search engine to find what this one specific customer said. Simply click on the user’s profile picture to see what conversations were made in the past so everyone is on the same page. This feature is also critical for teams who may need to send Twitter users to their sales as a possible lead. With so many users handling a single profile, Sprout Social makes it easy to streamline operations and limit double-entry work. 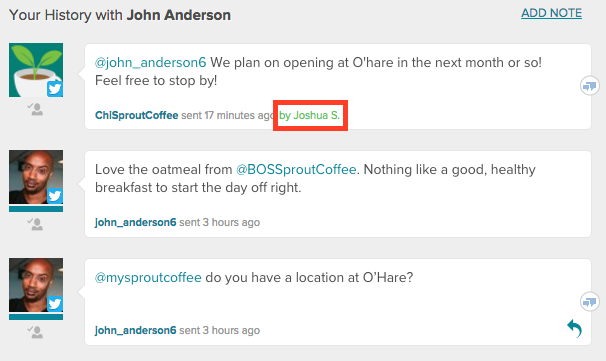 Another way to search your Twitter history in the Sprout platform is through the reply feature. Once you’re ready to respond, you will be brought to a window with a brief bio of the customer and your previous chat history. This gives you a quick glance at what’s been discussed and who on your team answered certain questions. Keeping track of Twitter conversations is critical to any business building a customer report. No matter how you use Twitter, conversation is the very definition of engaging your audience. By giving your social team some background, each of them will be able to deliver the best possible experience to your company’s connections. By using your Twitter search history more effectively, you’re able to find localized conversations around relevant topics to your brand. You can also find people, places and sentiments that could suggest purchase intent. Our Top Twitter Search Operators cheatsheet will also help you discover the social conversations that matter the most. Engage in more meaningful conversations and build lasting brand impressions by managing your Twitter search history data.